Low Carb Cream Cheese “Pancakes” was posted on October 22nd, 2012 and is filed under Breakfast, Gluten Free, Low Carb, Protein, Recipes. This entry has 20 comments. You can follow any responses through the RSS 2.0 Comment Feed. Over the last several weeks I have been doing a lot of low carbing. I find that, personally, my body is just happier with less carbs (especially grains). Gluten hasn’t been on my radar for over a month either and I barely miss it. Of course, when I have the ferocious craving for toast, this amazing bread recipe comes to the rescue. Overall though, I’ve been sticking to low carb meals. 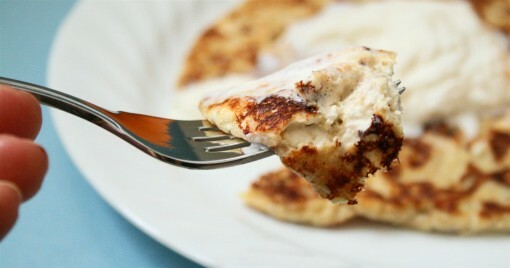 One of the recipes I’ve made what feels like dozens of times is the Low Carb Cream Cheese “Pancake”. I’ve seen a few recipes out there for it, but I wanted to share my version. It tastes like decadent cream cheesy French toast…without the toast. It’s one of my favourite breakfast recipes. Like ever. Serves 1. *You can just heat it in the microwave for 30 seconds so it stirs easily into the eggs. Stir all the ingredients together in a bowl. Pour half the batter into a pre-heated non-stick pan (with a little butter or coconut oil added to the pan). Cook until each side is done. Cook the other half of the batter. Makes 2 pancakes. I like to top my “pancakes” with Truvia or even a little whipped cream. I love this pancake because there are little pockets of cream cheese inside the pancake – it just tastes so decadent, yet the whole recipe is about 3 carbs! Happy joy joy. While I’m still drooling about this recipe and the awesomeness of cream cheese, I want to give you guys the heads up about a campaign I’m doing with SheBlogs. Think free groceries – for a year! The Real Women of Philadelphia is making that dream possible for three grand prize winners, in the form of $10,000 gift certificates from your favourite grocery store. It sounds kind of like a good deal to me! How to get a chance to win? Sign up for the Real Women of Philadelphia online community (super fun place for women who love to cook!) and automatically be entered into the sweepstakes. Weekly prizes will also be drawn for Free Philly for a year! Join the community and visit the site daily from Oct 15th – Nov 4th. Every time you post a comment anywhere on the site you automatically receive an entry to a maximum of 1 entry per day for 21 days. Contest opened October 15th, 2012 and ends November 4, 2012. In the meantime, you might just want to make these. Are you a fanatic for cream cheese? Do you enjoy low carb recipes? these sound amazing! I would never think to add cream cheese to my pancakes! yummy yummy yummy! I love different recipes for pancakes! these look so good! I don’t do well with a lot of grains either. Love the photos. Im a nice Jewish girl from Pa.
Looks yummy! I’m always amazed at what can be done without grains. I love cream cheese and that saltiness it adds to a sweet dish like this one. Oh, wow- yum! I’m realizing my body does better on less grains too, but as a runner- I crave them! Trying to find that balance is tricky. Just when I think I can live without dairy… these pancakes need to be in my life now. These were very good! I might use a little more cinnamon next time. I wish the cream cheese wasn’t so clumpy… think putting it in the microwave a little longer than 30 seconds will help? Man – now I need pancakes. And it’s 10:40pm. Not a good combo. LOL I’ve made a variation of these before, but yours looks better. YUM. It looks like only one is a serving size? Yes, but it should fill the whole frying pan for one big pancake. Feel free to double! These pancakes resemble crepes to me. Very thin very good. Is this recipes more of a liquid than a traditional pancake recipe or did I do something wrong? Hilary, it should be more like a crepe.